Last Friday I was perusing Facebook at work and saw something that really caught my eye. Instantly I jumped up from my desk and left without a word to anyone else. 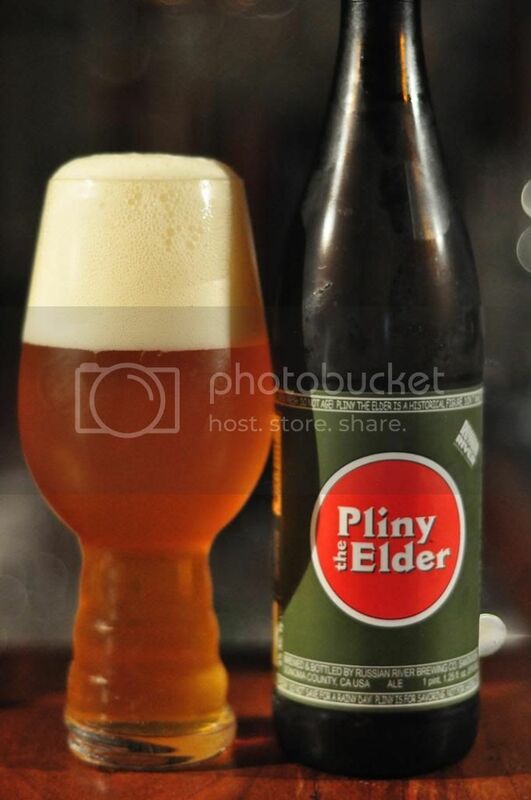 Acland Street Cellars had just posted that they had 8 bottles of the #1 beer on my beer bucket list; Pliny the Elder! This beer is widely considered the best IPA in the world. I first heard about it not long after I got into beer and ever since this has been the top beer on my bucket list. I'm still pinching myself that I have got a bottle of this beer, which is rarely shipped far from it's Californian brewery. As the bottle says; "Pliny the Elder is a historical figure, don't make the beer inside this bottle one!" Anything you say Pliny! Let's do this! If ever there was a time for the IPA glass this is it! Russian River's Pliny the Elder pours a perfect orange colour when the beer spews forth from the bottle with a thick, creamy looking head on top of it. The retention of the head is excellent and it leaves behind lovely webs of lacing, that I'm not sure I've seen the equal of. For the style; Pliny the Elder is the most aesthetically pleasing beer that I can think of! Pliny the Elder's nose, amazingly, is even better that how it looks! It's just hops on-top of hops on-top of hops! There's huge amounts of pine resin and citrus. There's floral and tropical fruit elements on the nose as well. It's a really awesome hoppy aroma; that's really all you can smell hops, hops and more hops! WOW! My mind & palate were both blown away by how much flavour Pliny had! There is nothing but hops detectable, no malt whatsoever. Russian River's Pliny the Elder is just a huge hop bomb, almost every hop flavour you can imagine is in this beer. Pine, grapefruit, lemon, orange; you name it it's there! I'm really struggling for superlatives to describe this, it's just amazing! I am so pleased to report that this beer lived up to my expectations and then some. It justified it's billing as the top beer on my bucket list and on a world scale. This beer is simply amazing and worth every cent I paid for it! I don't have the words to describe how good this beer was to drink; it's simply a must for all IPA drinkers!